‘Unconditional’: A Citizen’s Income would vary with age, but there would be no other conditions: so everyone of the same age would receive the same Citizen’s Income, whatever their gender, employment status, family structure, contribution to society, housing costs, or anything else. ‘Automatic’: Someone’s Citizen’s Income would be paid weekly or monthly, automatically. ‘Nonwithdrawable’: Citizen’s Incomes would not be means-tested. If someone’s earnings or wealth increased, then their Citizen’s Income would not change. ‘Individual’: Citizen’s Incomes would be paid on an individual basis, and not on the basis of a couple or household. ‘As a right of citizenship’: Everybody legally resident in the UK would receive a Citizen’s Income, subject to a minimum period of legal residency in the UK, and continuing residency for most of the year. This last point immediately raises the problem of who qualifies as a citizen, so I’m going to use the term Universal Basic Income (UBI). The idea of UBI has been supported by several Trades Unions (and by the TUC according to someone at the Unite meeting that Jo and I went to). 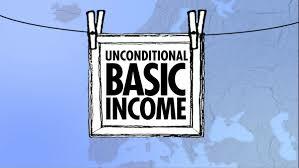 It’s also supported by the Green Party, the SNP, the RSA (Royal Society of Arts) and by the right-wing Adam Smith Institute (yes – the man whose mother cooked his dinner  ) This is what John Macdonnell said about UBI in his Labour Party Conference speech, “… I am also interested in the potential of a Universal Basic Income - to learn from its potential from the experiments currently taking place across Europe”. While there are no good arguments against the principle of UBI in an ideal society, the whole thing falls apart when we look in closer detail at the practical proposals. There are so many different models being proposed and experimented with (in Iran, Finland, Holland, Namibia, India and Canada, for example) that it becomes essential to clarify which model of UBI we’re arguing about. Then, when we pose questions about feasibility, we come up against the same issues we face with the notion of electability. How far can any prospective MP go when it comes to arguing for the redistribution of wealth? This would be paid for by abolishing: Income tax personal allowances, state pension, child benefits and all means-tested benefits except for Housing Benefit and Council Tax Benefit. 2) None of the proposals get rid of means-testing (nobody’s proposing to do anything about housing costs, rent regulation etc so they have to pay Housing & Council Tax Benefit). Also, the UBI is not going to be sufficient to pay for the needs of people with a range of disabilities (unless there were massive improvements in collective facilities and services). So that’s a whole other lot of means tested benefits to be retained. Reed and Lansley present 3 “full UBI models” but argue that these are probably too expensive and two of them appear to benefit middle-income groups more than the poorest. So they propose a modified scheme which leaves 80% of means tested benefits in place. 3) Any amount of means-testing involves bureaucracy on top of the administrative costs of UBI so current proposals don’t save much on administrative costs. 4) Gough describes these models as “a powerful tax engine to pull a tiny cart” although he concedes that growing interest in UBI does begin to challenge the link between work and subsistence in ways that open up possibilities for radical change. Several of the models concern themselves with questions about incentives to work (and the term “marginal withdrawal rates” comes up a lot here and I think this is something to do with the point at which tax on earnings cancels out the UBI). There has been quite a bit of research that shows adults will choose to work when given a choice, but Painter & Thoung’s proposals include a ludicrous system (which they describe as “elegant”), to ensure that young people develop a work ethic by getting witnesses to say they’re making good use of their time by doing things like digging holes and looking after people! 6) Political energy expended on campaigning for UBI would be better directed at housing, green investment, reducing working hours for all. Gough is working on a book on Capitalism, Sustainability and Wellbeing (forthcoming 2017) and also recommends an alternative to UBI in the form of a Charter of Entitlements which he said the New Economics Foundation were about to publish. Ken Loach’s film I, Daniel Blake adds much strength to this point!